Did you know that Steve Vai keeps pet bees? Or that Ian Gillan was in the same class at school as Pete Townshend? No? Didn't think so, but fear not! 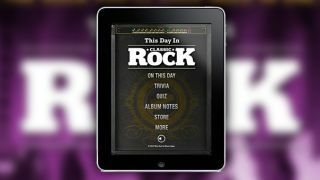 You'll never be short of rock facts again with Classic Rock's brand new interactive app, This Day In Classic Rock. Delivering a daily dose of rock trivia directly to your phone, This Day In Classic Rock includes an interactive quiz and over 75,000 words of expert critical analysis of 50 classic rock albums, from AC/DC to The Who and everything in between. It also features a free rock ringtone (created by Genesis and Mike & The Mechanics guitarist Anthony Drennan), plus two free wallpapers with every download. The Classic Rock App is all the rock you need - every day - for just £1.99/$2.99. This Day In Classic Rock is available now exclusively through iTunes, for iPhone, iPad and iTouch.